So lets try this one and see what happens? Who's dyno was it and what kind? VS. What did you run? And what is the weight? Please write yours out like this and I will keep it updated to compare. Last edited by EmeryatSTM; Jan 1, 2011 at 07:42 PM. Should we also add weight? To make this more legible, why not define a standard format and list of information then maintain the list in the first post. .. hell, maybe even a spreadsheet in Google docs or something. Would make the information easier to parse than picking through a thread for relevant posts. Are you volunteering? Go for it! Sounds like a great idea. Nope, just offering up ideas to try and steer this thread away from finding its way into the dumpster. A dyno sheet and track slip can be provided for accuracy but the weight there is no telling who will be truthful and who wont.. Good luck with this one EM.. I officially LOVE this thread!!! +1 for timeslips, weight, and dynosheet as a rule of thumb. Video of the pass would even be over the top!! Last edited by [email protected]; Jan 11, 2010 at 03:02 PM. how about the driver and tires ? 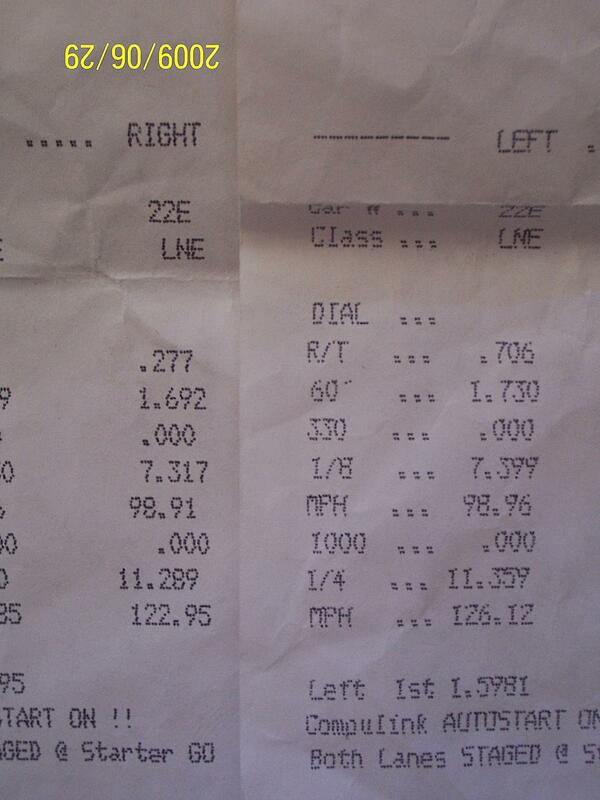 i dont think i would pull a same number as many drag guys here with the same car same conditions. This should be interesting. You always see people all over say "Yea who cares about the dyno numbers, the trap speed will tell us how much power youre making" ...And then it ends there because it seems like no one has the final answer as to how much power a car makes that traps 115 or 120 or 130 lol. Edit: And in the end...I guess who really cares lol. The 120 car makes more power than the 115 car which both make less power than the 130 car haha. But still, this will be useful to finally make some good comparisons. Last edited by Svendiesel; Jan 11, 2010 at 04:10 PM. in the galaxy ? But does it smell stock ? Here's my contribution since the slow Evos can also provide useful data!